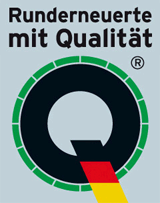 PRL – a promise of quality: With the PRL tread, you are purchasing a high-quality premium product. The PRL product line combines state-of-the-art tread designs with advanced rubber compounds, for performance that rivals that of new tires. In addition to the benefi ts and performance of all PRL treads, the BLACKLINE product range has been developed with new compounds, especially selected and combined to guarantee performance in respect of the highest market expectations concerning fuel consumption, life and grip in dry and wet conditions. The high-quality contoured tread thanks to its prevulcanized contour profi le perfectly adapts itself to the casing, it supplements the fl at tread range in some areas, for instance wide SuperSingle trailer treads, and also in the area of all-position tires. The tread depth, too, is analogous to that of corresponding new tires, so that the PRL treads are suitable for retreading of high-quality casings and for quality-oriented customers. Buyers of PRL treads know that it is not the price of the tread that is decisive but that other parameters are important to haulers, such as „tire cost per kilometer“ and, increasingly, „tire-dependent costs per kilometer“, which takes into account not only tire cost but also the infl uence of tire selection on fuel consumption. In addition to outstanding quality, our PRL product line stands for particularly effi cient workmanship in the retreading process. The lengths tailored to the respective casing dimension help the retreader avoid waste and working with two joints. There is no „remnant management“ in the retreading process, and the handling of the light single lengths is in the long-term good for the health of the employees.